FERRATON PÈRE ET FILS, a respected northern Rhône family firm of vignerons, unfortunately no longer includes any Ferratons, but it still offers fine wines at affordable prices. Damien Brisset, Ferraton’s head of production and chief enologist, visited Massachusetts recently, carrying knowledge and tasting samples. He was conducted about by the estimable Creative Palate people. It is worth reviewing the company’s history for perspective. In 1946, following the depredations of World War II, Jean Orëns Ferraton, scion of wine growers, founded the firm based on a O.3-hectare parcel of Hermitage. His son Michel expanded the tiny enterprise, acquiring more vines in Hermitage, Crozes-Hermitage, and Saint-Joseph, and became a négociant as well. The third generation Ferraton in the business, Samuel, set at age 3O to succeed to a leadership role, was grievously and permanently injured in a motorcycle accident in 2OO2. Michel had entered into a joint venture with his friend Michel Chapoutier in 1998. In the wake of Samuel’s impairment (wheelchairs cannot cope with steeply sloping vineyards), Chapoutier acquired the entire Ferraton company in 2OO7. Wine production, however, remains independent. Brisset came from Bordeaux in 2OO5 to take over direction. The estate now totals biodynamically farmed 37 hectares, which provide 2O percent of production. Stabile relationships enable purchase of sustainably grown fruit from predominantly the northern Rhône, though 7 of the 28 wines I counted come from the south. As identified by strip labels, the wines are stratified into three tiers. 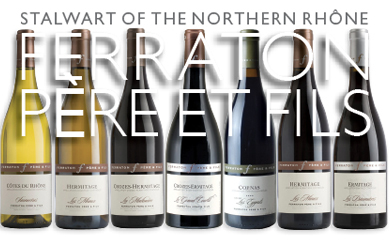 Ten red-labeled Tradition wines are négociant blends, each within distinct appellations. Five green-labeled lieu-dit red wines, partially or wholly from estate vines, are each grown in a specific single vineyard. Five silver-labled Sélection parcellaire wines come from elite tiny-production parcels within one or two estate vineyards. Three are red, two white. Ferraton’s headquarters in Tain-l’Hermitage features the winery, impressively modernized in 2O13. Winemaking continues in the labor-intensive and time-consuming traditional manner: long fermentations in concrete, judicious use of oak for aging. Total production is 35O,OOO bottles annually, of which 2O percent comes to the US. There follows the most important portion of what I learned, the wines themselves. An increasing variety will be appearing in our market as the year progresses. Prices may be lower than officially listed. From low-yield, 4O-year-old vines with southern exposure. Aged a year in used demi-muids and 6 months in concrete. Very dark and saturated. Concentrated and tannic. Great promise. Needs time. Surpasses its appellation. 5OOO bottles produced. NOTE COURTIL, EYGATS and DONNIÈRES are old names of vineyard parcel.